Today is World Homelessness Day. Today we call on all people across Greater Manchester to help make a real difference. It sounds obvious – but people who are homeless are people. say hello. Make eye contact. Download the Streetsupport app and ask if there’s anything they need today and look up on the app where they can find it. Give up your lunch. Trying to focus while feeling a bit hungry is a small way of understanding how tough it must be to plan for the future/think about accommodation/finding work, when you are worried where your next meal will come from. Why not donate your usual lunch money to Mustard Tree? You can text MUTR17 £5 to 70070 today. You can see below the kind of difference your support makes. Did you know the life expectancy of a man who is homeless is 47, and for a woman, 43? Last year’s annual count of rough sleepers in Greater Manchester found 278 people bedded down outside, a 41% increase on 2016. But research shows the number is likely to be more than double that total. For every person who is street homeless, there will be hundreds of people who are hidden homeless and at very high risk of losing the shelter they have; people and families housed in B&Bs, sofa surfing, in overcrowded temporary accommodation or at the mercy of rogue private landlords. It may be hard to imagine how it must feel; isolated, often alone and feeling like you have nowhere to turn. The effect on mental health can be devastating. In 2017, Homeless Link showed 71% of people who are homeless experience a mental health condition. 49% of people who come to Mustard Tree are suffering from poor mental health. This seems a pretty bleak picture. World Homelessness Day seems daunting; there are so many people out there that deserve support. Only seeing the issue as percentages and numbers can take away from the reality of the situation. Behind each number are people, each one with often a complex story and requiring different support to make real lasting life changes. Each person deserves to live in dignity and comfort and be part of a community. Donating your lunch money today, could help change someone’s life. 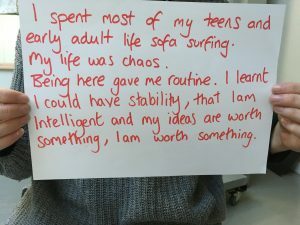 By supporting us, you are helping to provide a safe and supportive space where people find the skills and self-confidence they need to escape poverty and homelessness – for good. 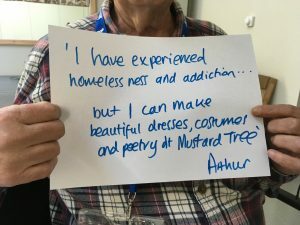 Below are experiences of people at Mustard Tree who have been homeless and/or experienced poor mental health that highlight all the other things they have discovered they are, or that they can do. That make them who they are. Be inspired and have hope – your support makes it possible. 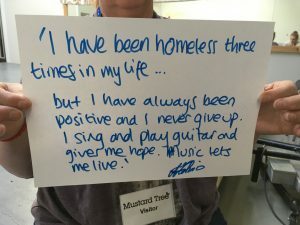 Support us today so we can be there tomorrow http://www.mustardtree.org.uk/support-us/donate-money/ or text MUTR17 £5 to 70070.